Earlier this year, the University of Saskatchewan President’s Office requested that I compose a brief summary of the meaning and significance of the Treaty Six flag and that I serve as MC when the Treaty No. 6 flag was raised at the University on March 12th, 2013. Following are excerpts from my presentation that day at the University of Saskatchewan’s inaugural raising of the Treaty Six Flag. The Union Flag, commonly known as the Union Jack, is the flag of the United Kingdom and is known by law in Canada as the Royal Union Flag. The flag originated in 1603 with the union of the crowns of England, Scotland and Ireland. On 12 April 1606, a new flag to represent the union between England and Scotland was specified in a royal decree. The current design dates from the Union of Great Britain and Ireland in 1801. The flag combines the crosses of England, Ireland and Scotland: the red cross on a white background known as Saint George’s Cross, and two x-shaped crosses, the red saltire of Saint Patrick, and the white saltire of Saint Andrew. In 1876 when Treaty Six was affirmed between First Nations and the Crown, each Chief who was a signatory to the Treaty was given, among other items, a Union Jack Flag and a Treaty Six Medal. Cree Nations based the Treaties on Nehiyawpakitinkosowin ‘Cree Inherent Rights’, and Nehiyawitapsinowin ‘Cree Perspective’ and based its time and space within the realm of nature as they understood it. [SRO: nêhiyaw pakitinikowisiwin; nêhiyaw itâpisiniwin]. Treaties reflect First Nations’ relationship with the land which must be acknowledged and taught to all people if they are to fully comprehend the spirit and intent of treaty. They were not merely contracts with the Queen as they have been perceived to be. They were undertaken as sacred commitments of the highest form where Creator was considered the binding factor. The natural forces symbolized their expected continuity. [SRO:] iskoyikohk pîsim ka-pimohtêt, iskoyikohk sîpiy ka-pimiciwahk, iskoyikohk maskosiya kê-sâkikihki. Treaties basically outline the rights we were to have in return for sharing Ministik (Canada; literally ‘island’, that is, ‘Turtle Island’). This has been misinterpreted as meaning total and complete surrender. Some of these rights were tax exemption, the right to medicare, education, and unlimited hunting and fishing to sustain the lives of our people. These Treaty Rights have dwindled over time and there is constant Government effort to misinterpret them even more but, they’re still here. Our Grandfathers had remarkable foresight for a people with no concept of the English language or of British Law. They had faith in the forces of Nature to ensure their infinity. This is Nehiyawitapsinowin [nêhiyaw itâpisiniwin] in its purest form. Kawiycikowa – to get requested assistance until such time as it is no longer needed. The Treaty Six Flag was designed to raise awareness that this is Treaty Six Territory and that the state of Canada could not have been founded without these Treaties. Treaties are our legacy and we must protect these rights at all costs. Thanks to Tyrone for permission to re-post these Facebook comments, and for directing me to the fabulous flag song recording on Youtube. Thanks to Arok Wolvengrey for providing Standard Roman Orthography (SRO) equivalents for the use of those learning to read that way, and for quickly producing the quote from Jim Kâ-Nîpitêhtêw when I asked. 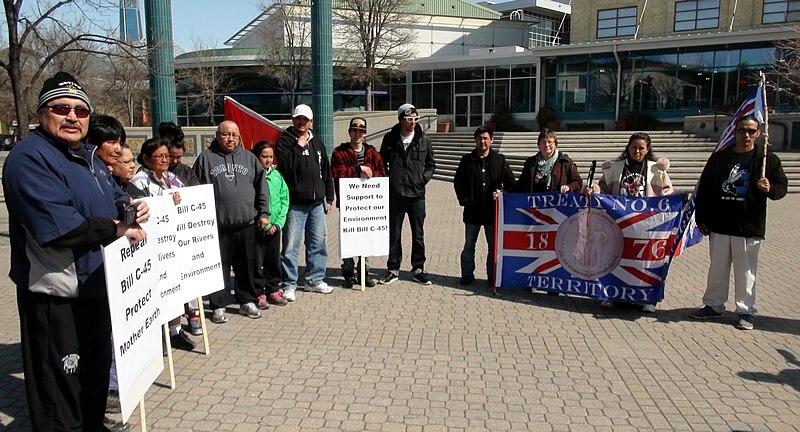 Small personal post script: I was also proud to help my warrior sister Nancy Greyeyes display the Treaty Six Flag during her visit through Winnipeg on her “Journey for Earth” walk to Ottawa. This entry was posted in Cree History, Songs in Cree and tagged Treaty 6, Tyrone Tootoosis. Bookmark the permalink. Was there ever a treaty card issued with a Union Jack emblem on it? my father supposedly had one but I never did see it. And why did they have to sign away their treaty rights when he joined the war in ’44, he did get them back after though when his term was up. Where can you buy Treaty 6 flags? Do we know the name or names of those who composed the Treaty 6 song?